Photo of Saratoga Bob by Laurie Asseo. 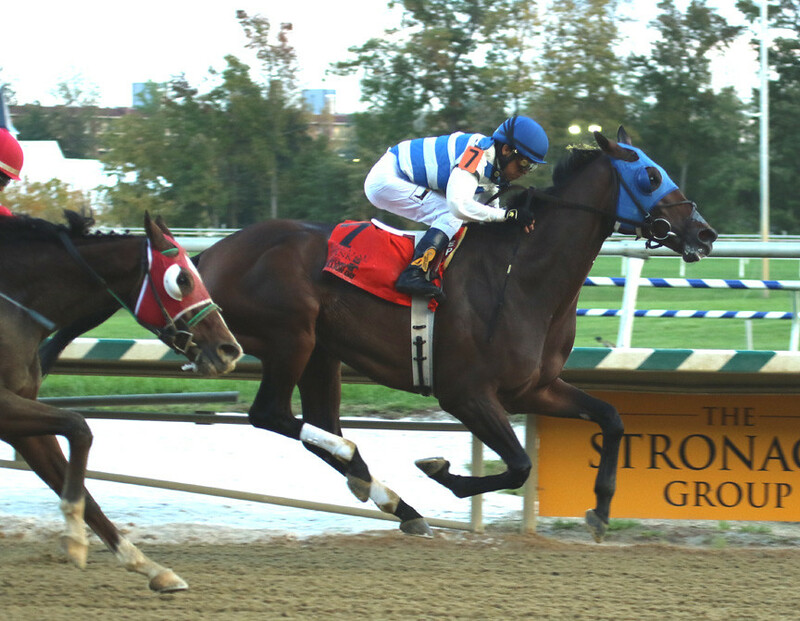 Saratoga Bob, a half-length winner of the $150,000 Maryland Million Classic in his previous start, makes his return in a $45,000 second-level optional claimer for 3-year-olds and up that serves as the feature of a nine-race program when live racing resumes at Laurel Park Thursday. Owned by Wayne Harrison, Robert Manfuso and trainer Katy Voss, and named for his co-owner and breeder, Saratoga Bob drew Post 3 and is the 5-2 second choice on the morning line in a field of 10 that includes fellow stakes winners Greatbullsoffire and Homespun Hero. Saratoga Bob sat off long shot pacesetter Pal Cal for a half-mile in the 1 1/8-mile Classic Oct. 20, then dueled on a slim lead through six furlongs before edging clear in deep stretch and holding off late-running Dothat Dance for his first career stakes win. Overall he has three wins, three seconds and two thirds from nine lifetime starts. The gelded 4-year-old son of Friesan Fire cuts back to seven furlongs Thursday. He was a front-running four-length maiden claiming winner April 20 at Laurel in his only previous start at the distance. His regular rider, Hall of Famer Edgar Prado, will be aboard at topweight of 125 pounds, giving away three to five pounds to his rivals. Favored at 2-1 in the progam is Standing Rock Farm’s Divine Interventio, claimed for $16,000 by trainer Lacey Gaudet this summer at Saratoga. In three tries since, the Malibu Moon gelding was second in the Punch Line Stakes against Virginia-breds Sept. 23 and won an open seven-furlong allowance Oct. 5. He has two wins and four seconds in nine lifetime tries at the distance. Kathleen Willier’s Greatbullsoffire, second in the Maryland Million Sprint last time out, just his third start off nearly a year layoff, won the Strike Your Colors, Maryland Million Nursery and Maryland Juvenile Futurity as a 2-year-old for trainer Hamilton Smith. Tag Stables and Bedlam’s Homespun Hero was third in the Punch Line after winning the Meadow Stable Stakes, also against Virginia-breds, Aug. 4. First-race post time Thursday is 12:30 p.m. There will be carryovers of $3,932.77 in the 20-cent Rainbow 6 (Races 4-9) and $3,367.40 in the $1 Super Hi-5 for Thursday’s opener, a $25,000 maiden claimer for 2-year-olds at one mile.